The SUPER CHUTE offers a wide open training space. Measures 20' by 10'. Makes playing low a habit. Multiple players can work at the same time. 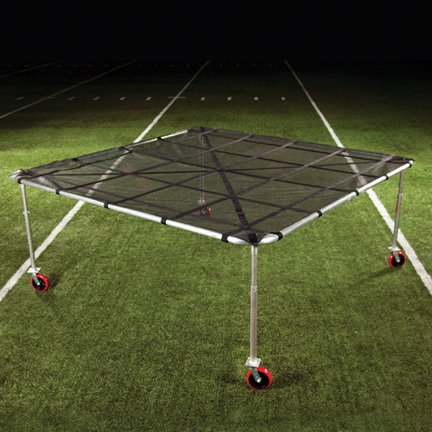 Clear span design gives players the freedom to enter and exit the chute from any side. Soft mesh top allows players to work without helmets. 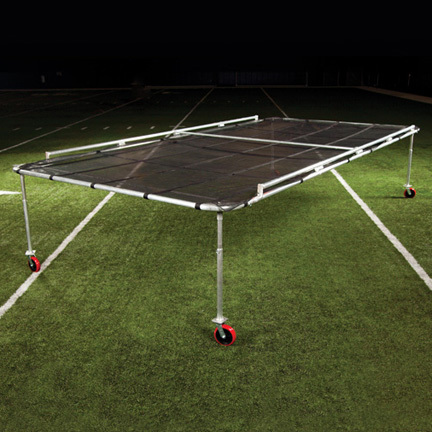 Great for off-season conditioning and agility drills. Teach DB’s the basic fundamental of low pad level as well as the skills of breaking on the ball and change of direction. Ideal for “W” and “Star” drills. Back-pedaling and breaking at 45 and 90 degree angles. Top frame has extra strength and rigidity to prevent it from bending out of shape. Side frame truss reinforces the structural integrity of the frame. Welded corner sockets keep the legs perfectly vertical. Spreader bar keeps the mesh screen taut. 8" solid polyurethane wheels with swivel capability offer easy movement on grass or turf. Adjustable in height from 42" to 66". Lightweight and portable. Made entirely of aluminum. Will never rust! "The coaching point is to play with low pad level while going in and out of breaks!"